Should I use C# ASP.NET MVC or WPF MVVM? Is there a way to get UpdateSourceTrigger=PropertyChanged for compiled bindings? How to get a text message from a captured packet? File upload working on asp.net localhost but not working remotly after publishing on IIS? Data from room database doesn't show in recycler view. What might be wrong? I've created a C# library that handles resource management. I need a GUI application that can be accessed by different remote users, which will instantiate and use the resource management library. It's not required that users access this application concurrently, but it could be a nice to have. Would have to be stored on a Windows machine, running as an application. Users would have to TeamViewer / Remote login to use the application. Could be easily run on a web server/internal LAN? Could be accessed remotely via URL? Could create a simple login system. I have a limited time frame to complete this project and I would be able to code all of this relatively easily/quickly using WPF, but ASP.NET seems better suited. How well do skills transfer from WPF MVVM to ASP.NET MVC? Which framework would be recommended considering the above factors? When I am trying to run the code then I get this error "System.ArgumentNullException: text cannot be null Parameter name: text" it doesn't pull the data from excel file; can anyone please give me the suggestion that how to fix this issue? I'm working on a UWP application and I realized that the default UpdateSourceTrigger mode for the TextBox control, which is LostFocus, can't be changed when using a compiled binding. Now, this is not too bad, but having to remember to create the TextChanged handler every single time a TextBox is used is annoying and error prone. But of course, here there would be the additional overhead of usinc classic bindings (involving runtime reflections, etc.). Is there a way to get the same behaviour of UpdateSourceTrigger=PropertyChanged as well? I'd be completely fine with, say, writing a custom attached property that sets things up, as long as I can do everything I need directly from XAML, with no code behind involved. I made a program that sends / receives messages from the same program that is a server. Used classes TcpClient and NetworkStream. I send messages in this way and everything works. Made examples from the Internet sniffer, which intercepts packets from the specified IP. I send a message from the client / server: "test" and intercept the package with a sniffer. I am trying to display the data, but the gibberish is displayed. What is the problem? I am trying to upload file over size of 60Kb but the progress is stacked. but I can upload any size from iis localhost. I am working on a solution wherein I have the mobile number of the end user and need to pull is profile details from whatsapp including his profile image in ASP.NET MVC. Is it possible and legal? I have been trying to use Webp images on my website however they would show up as broken images on all browsers. I have tried a solution from dejanstojanovic (I didn't completely get what was happening in there, although I did understand it was checking if the browser is compatible with webp and then sending the webp version if it was else it sent a png or jpeg version) however, that didn't work. Similarly, I tried a solution from deanhume but likewise, that too didn't work. Both code returned a webp file which should be supported by chrome however there was a broken image on the page. I checked to make sure it is not the fault of the path by putting a png file and webp file in the same folder and displaying them both. The png file works perfectly, however, the webp file is missing. Furthermore, the webp file also works if I use raw HTML, just not with ASP.NET. The view 'https://s3.amazonaws.com/testtt123/test.cshtml' or its master was not found or no view engine supports the searched locations. // The default HSTS value is 30 days. You may want to change this for production scenarios, see https://aka.ms/aspnetcore-hsts. I have a TreeView which get's cool animation effect thanks to these styles being added in my UserControl's resource dictionary. Later on I plan to implement some way so the user could switch between the three styles from the three dictionaries. Recommendations how how to best implement that are welcome. I have a TreeView which I need to change the behavior of, such that some Items (or Nodes might be more correct) should have their children always expanded based on a Binding to a VM property. Also when I select an item in the tree view the item's child tree should automatically expand. When I leave the item the childtree should collapse unless it is set to be always expanded. I have managed to do all this by Edit a copy of the TreeView's ItemContainerStyle. The problem and my question, as soon as I define/edit my own copy of the ItemContainerStyle I lose all the animation effects since it overrides the default set style from the MaterialDesign Resource(s). How can I make sure my ItemContainerStyle keeps the animations and styles also from the MaterialDesign Referenced ResourceDictionary(ies)? I have a couple of WPF projects that fail to compile due to error The type or namespace name 'X' does not exist in the namespace. Here is a minimum reproducible sample. 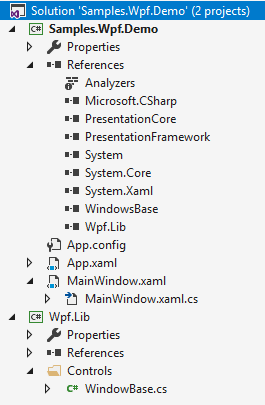 There is a class library called Wpf.Lib where I define a class called WindowBase. Then, I have this app project called Samples.Wpf.Demo, where I have a reference to Wpf.Lib. I think the compiler gets confused because it finds Wpf.Lib and then it has Samples.Wpf and assumes there is a Samples.Wpf.Lib. How do I fix this, other than changing the namespaces, which is something I would prefer not to do for reasons (part of a larger library and I want consistent namespaces). I tried extern aliases but that didn't help. This is ok and i am able to run the wpf ui from winform with the parameters that has been sent as arguments. But now i have a problem. now i want to update the message in the running wpf window. Already the wpf window is run and showing the message. 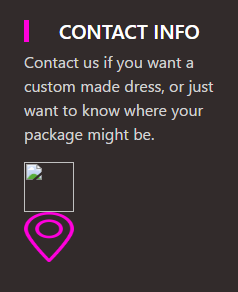 Later i want to send another message to that same wpf window. how we can achieve that ? // here we need to add the code to send message to the same wpf window. I would like to show my items in a recycler view via RoomDatabase. But when I start application - it shows empty screen with only title. What can I do to solve this problem? If you need more code - just tell me about that! I am using wpf in C# with caliburn micro mvvm. I have a list box that displays a set of filenames that references tsv files. I modified the file names to something else as required in the project. However now when the item is selected, the path is completely lost. How can I modify the file name to whatever I want but still retain the filepath?